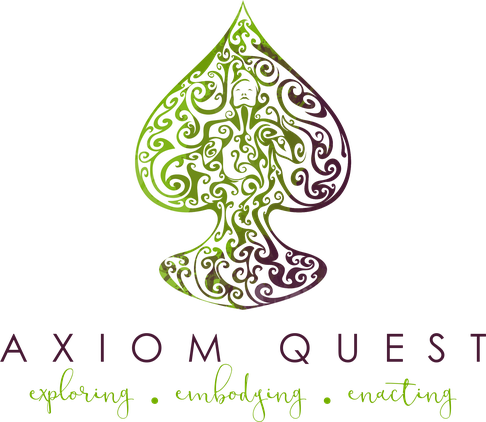 The Axiom Quest logo was created by Remus Rigo to symbolize our vision to Embody Life More Fully! Our passion is to help clients discover and develop through embodied inquiry and practice. The words Axiom Quest mean the pursuit of that which has value. Our journey Exploring (quest for discoveries); Embodying (soul invested with physical form) and Enacting (to establish) is designed to awaken our embodied wisdom. Our path of embodied inquiry and practice is represented by the body looking Heavenward with outstretched arms opening to connect and receive creative opportunities eager to emerge. Learning to derive meaning from our felt-sense founded upon a centered presence and heartfelt connection enables us to live our lives more fully. The tree signifies life, extending skyward from roots sprouting from Earth. Just as trees shape themselves around the nutrients of soil, sunlight, and water, our nervous system shapes itself around the nutrients of safety, connection, and dignity. The spade shape of this tree symbolizes wisdom, acceptance, and labor. As a tool, the spade is used for unearthing, preparing soil for new life. And so it is with embodied inquiry and practice co-created with you to discover what new way of being generates greater possibilities. As the color of nature, green symbolizes growth and harmony. With a strong emotional correspondence with safety, olive green is the traditional color of peace. Combining the stability of blue with the energy of red, purple is associated with wisdom, dignity, independence, creativity, mystery, and magic. The integration of both green and darker purple represents the critical contrast between shadow and light. A conscious life creates meaning in these contrasts between both parts of the whole needed for our development and transpiration. 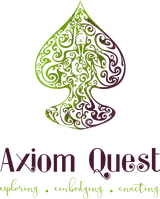 As a whole, Axiom Quest exemplifies our core values of Integrity, Insight, Intuition, Initiative, and Industry. What learning is awaiting your discovery? What challenges are you facing that could be opportunities in disguise? How can you transform your learning into action? © 2019 Axiom Quest LLC. All Rights Reserved.